Well, I never thought it would come to this – that the blog I started on January 1, 2009, for a one-year experiment would still be going. At the end of that first year, I had (I’m bragging here) five followers! Yes! Five! Can you imagine my excitement?! Along the way, photography has become increasingly important to me, and I work hard at it, at tuning my personal vision, at improving my technical skills, and at having fun with it. (“Having fun with it” requires the least amount of work.) I’ve been in shows, gotten a handful of awards, participate in a local artist studio tour, taken some classes, etc. And I’ve made friends through the blog, which is something that I never even considered to be a possibility when I started. That’s the best part, really. I’ve enjoyed getting to know a lot of you via our comments, and have been lucky enough to meet a few of you in person. You have all made my blog special. Anyway, here we go, on year eleven of this experiment. Thank you to everyone who’s coming along with me on this adventure! Are you a glutton for punishment? Do you enjoy looking at not-very-good images? Do you want a way to waste some of your valuable time? If any of these things are true, you can see my previous blogs here and here and here. Starting in 2012, I jumped from Blogspot to Word Press and you can see all of that stuff right here. I apologize in advance for the awfulness you are likely to encounter if you follow any of those links. At one point, I told my friend Ehpem that I was thinking of deleting those old blogs. Ehpem’s advice? To keep them, for historical purposes. Or did he say “hysterical” purposes? Probably that last thing. Posted on January 1, 2019, in Photography. Bookmark the permalink. 6 Comments. To post an image a day is a huge undertaking and to have maintained it for 10 years is quite an accomplishment. 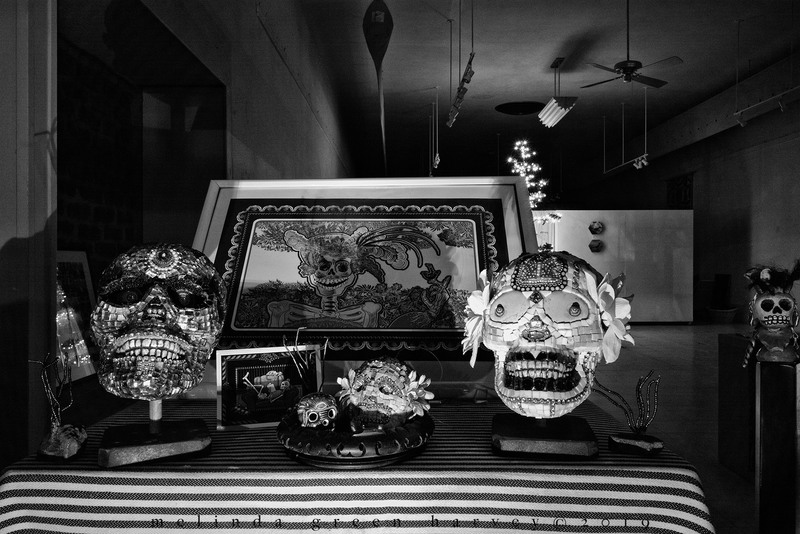 The photographs (from day one and today) both look like they are from an exhibition about Mexican Day of Dead? Are they museum or gallery shots from an exhibition? Thanks! The whole thing is rather astonishing, actually! The first shot (which does have a Christmas tree in the back) was taken through the window of an art gallery in Alpine, Texas. The second shot is on a ledge in my studio. 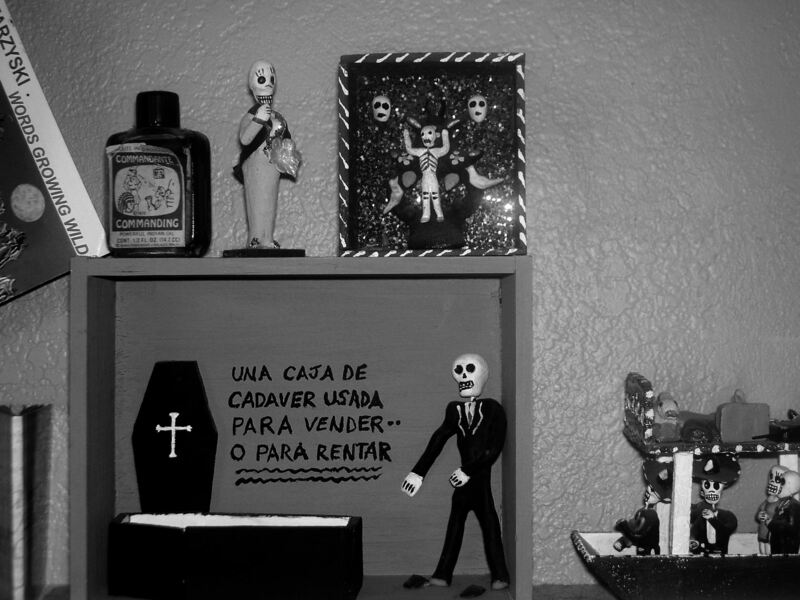 And they are both Day of the Dead items. Thanks for following the blog, too! I just had a look at your blog, and am now following it. I am proud to say I waste some of my day following you. Happy for your awards and success. I appreciate your dedication, and your comments. Best wishes to you for 2019! If I ever start getting the big head about my photographic skills, those old blogs will knock me right back to reality.